Azure Automation provides the ability to import PowerShell modules into your Automation Account to be used by the PowerShell based runbooks. These modules can be custom modules you've created, from the PowerShell Gallery, or the AzureRM and Az modules for Azure. There are multiple ways that you can import a module into your Automation Account. The following sections show the different ways to import a module. The max path of a file in a module to be used in Azure Automation is 140 characters. Any path over 140 characters will not be able to be imported into the PowerShell session with Import-Module. 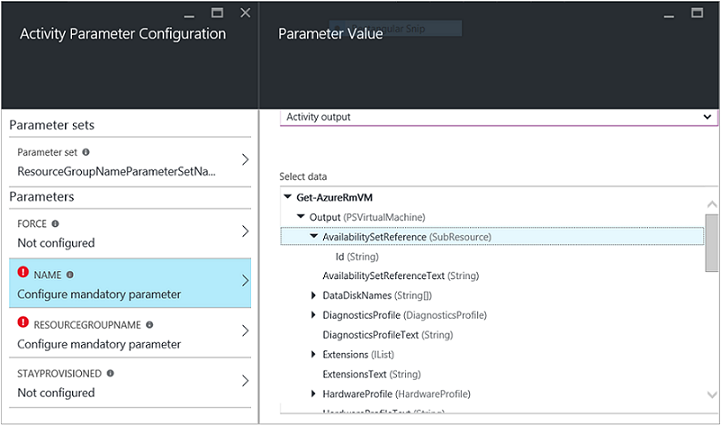 You can use the New-AzureRmAutomationModule to import a module into your Automation Account. The cmdlet takes a url to a module zip package. In the Azure portal, navigate to your Automation Account and select Modules under Shared Resources. Click + Add a module. Select a .zip file that contains your module and click Ok to start to import process. Modules from the PowerShell gallery can either be imported from the PowerShell Gallery directly or from your Automation Account. To import a module from the PowerShell Gallery, go to https://www.powershellgallery.com and search for the module you want to import. 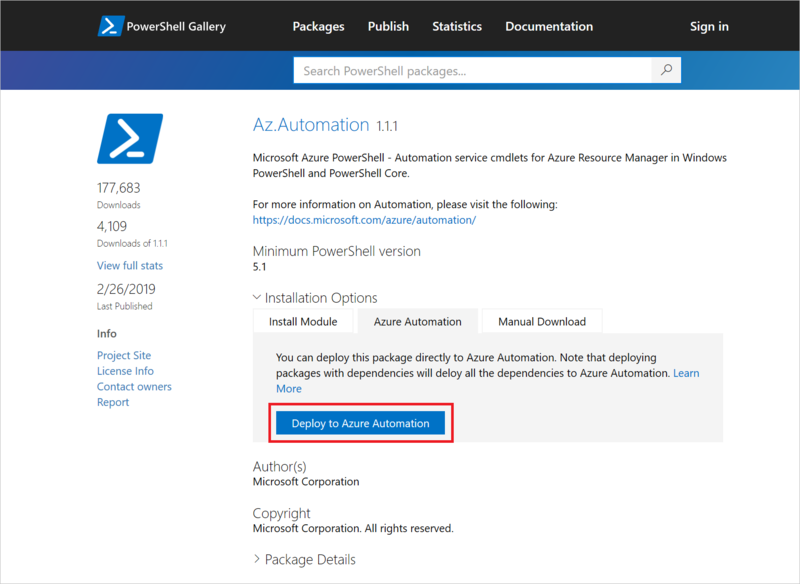 Click Deploy to Azure Automation on the Azure Automation tab under Installation Options. This action opens up the Azure portal. On the Import page, select your Automation Account and click OK.
You can also import modules from the PowerShell Gallery directly from your Automation Account. In your Automation Account, select Modules under Shared Resources. On the modules page, click Browse gallery. This opens up the Browse Gallery page. You can use this page to search the PowerShell Gallery for a module. Select the module you want to import and click Import. On the Import page, click OK to start the import process. The following is a listing of cmdlets in the internal Orchestrator.AssetManagement.Cmdlets module that is imported into every Automation Account. These cmdlets are accessible in your runbooks and DSC configurations and allow you to interact with your assets within your Automation Account. Additionally, the internal cmdlets allow you to retrieve secrets from encrypted Variable values, Credentials, and encrypted Connection fields. The Azure PowerShell cmdlets are not able to retrieve these secrets. These cmdlets do not require you to implicitly connect to Azure when using them. 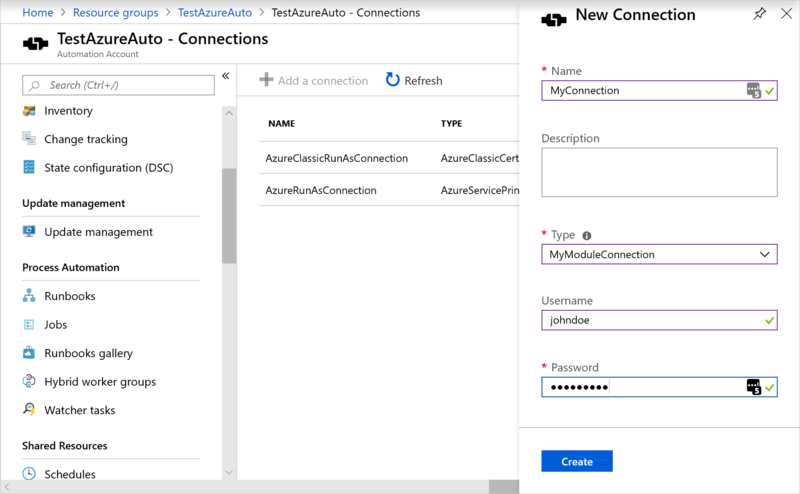 This is beneficial for scenarios where you have a connection, such as a Run As Account that you need to use to authenticate to Azure. You can provide a custom connection type for you to use in your Automation Account by adding an optional file to your module. This file is a metadata file specifying an Azure Automation connection type to be used with the module's cmdlets in your Automation Account. To achieve this you must first know how to author a PowerShell module. For more information on module authoring, see How to Write a PowerShell Script Module. PowerShell modules can be imported into Azure Automation to make their cmdlets available for use within runbooks and their DSC resources available for use within DSC configurations. Behind the scenes, Azure Automation stores these modules, and at runbook job and DSC compilation job execution time, loads them into the Azure Automation sandboxes where runbooks execute and DSC configurations compile. Any DSC resources in modules are also automatically placed on the Automation DSC pull server. They can be pulled by machines when they apply DSC configurations. Providing this info shows this help using the Get-Help cmdlet in the PowerShell console. This description is also displayed in the Azure portal. If the module connects to an external service, it should contain a connection type. Each cmdlet in the module should be able to take in a connection object (an instance of that connection type) as a parameter. This allows users to map parameters of the connection asset to the cmdlet's corresponding parameters each time they call a cmdlet. Based on the runbook example above, it uses an example Contoso connection asset called ContosoConnection to access Contoso resources and return data from the external service. In the following example, the fields are mapped to the UserName and Password properties of a PSCredential object and then passed to the cmdlet. You can enable behavior like the preceding example for your cmdlets by allowing them to accept a connection object directly as a parameter, instead of just connection fields for parameters. 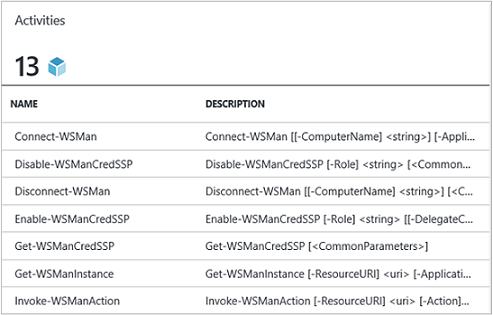 Usually you want a parameter set for each, so that a user not using Azure Automation can call your cmdlets without constructing a hashtable to act as the connection object. The parameter set UserAccount, is used to pass the connection field properties. ConnectionObject lets you pass the connection straight through. Define the output type for all cmdlets in the module. Defining an output type for a cmdlet allows design-time IntelliSense to help you determine the output properties of the cmdlet, for use during authoring. It's especially helpful during Automation runbook graphical authoring, where design time knowledge is key to an easy user experience with your module. This behavior is similar to the "type ahead" functionality of a cmdlet's output in PowerShell ISE without having to run it. Make all cmdlets in the module stateless. Multiple runbook jobs can simultaneously run in the same AppDomain and the same process and sandbox. If there is any state shared on those levels, jobs can affect each other. This behavior can lead to intermittent and hard to diagnose issues. Here is an example of what not to do. The module should be fully contained in an xcopy-able package. Azure Automation modules are distributed to the Automation sandboxes when runbooks need to execute. The modules need to work independently of the host they're running on. You should be able to Zip up and move a module package and have it function as normal when imported into another host's PowerShell environment. In order for that to happen, the module shouldn't depend on any files outside the module folder. This folder is the folder that gets zipped up when the module is imported into Azure Automation. The module should also not depend on any unique registry settings on a host, such as those settings set when a product is installed. All files in the module should have a path fewer than 140 characters. Any paths over 140 characters will cause issues importing your runbook. If this best practice isn't followed, the module won't be usable in Azure Automation. If referencing Azure Powershell Az modules in your module, ensure you aren't also referencing AzureRM. The Az module can't be used in conjunction with the AzureRM modules. Az is supported in runbooks but aren't imported by default. To learn about the Az modules and considerations to take into account, see Az module support in Azure Automation.